Our Restaurant. 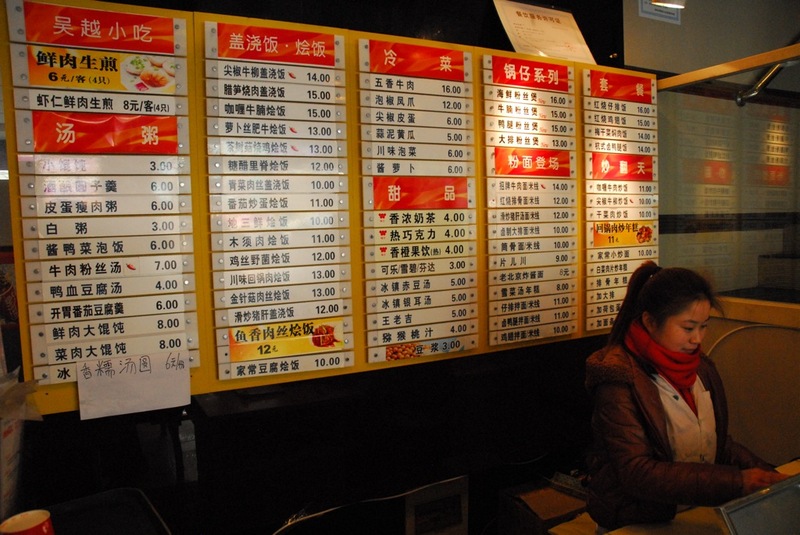 The very first time we went out to buy food, this is the menu that greeted us. Pretty daunting. Neither the menu nor the very kind young girl behind the counter contain a word of English–not that unusual in China, I suppose. Nevertheless, we managed to order noodle dishes for lunch, and were delighted with the result..We go back often. Our third day, Saturday, is a day of organization and writing. We spend time cleaning the apartment and unpacking all the stuff that hasn’t gotten unpacked–at least most of it. Everything is pretty much in disarray. It’s amazing how chaotic life becomes when I move out of my house and away from my systems of organization and living. Suddenly, I can’t remember where anything is, and I realize that I have taken for granted so many of the routine daily activities that now take thought and planning–such as, where do I keep the toiletries that can’t conveniently be stored in the bathroom, where should I put these extra rubber bands, how do I get more water. It’s actually kind of fun to figure out. Sometime in the early afternoon we go out for lunch. We arrive at the restaurant that Mr. Shen has shown us and we go inside. I have written on a recipe card the words for beef, pork, chicken, fish, soup, rice, and noodles. I look at the young girl behind the cash register and say the word for noodles: mian (mee-yan). No response. I try again. The girl returns a look of bewilderment. After continuing to speak to each other in languages that neither of us understand, a patron finally rises from his table and offers to help to translate between us and the girl. It helps. 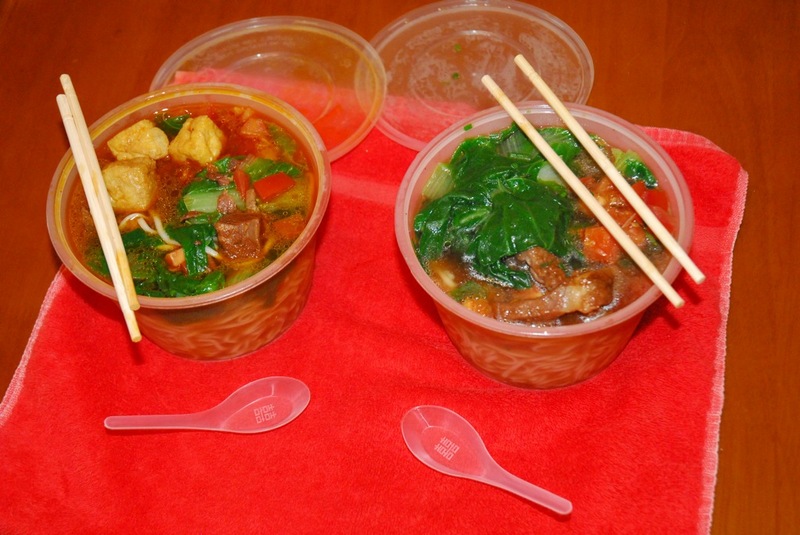 Our first purchased take-out lunch–noodles with beef and noodles with pork. “What would you like,” the patron says, in broken English. “Noodles,” we say, in perfect English. Our Chinese is less than broken; it’s more like non-existent. After some back and forth, we order noodles with pork and noodles with beef. We pay 24 yuan ($3.80). We return with our lunch to the apartment and are surprised and delighted. We have huge portions of food for $1.90 each. No wonder that those we spoke with who came before us said that they rarely cooked; eating out is quite inexpensive. In the apartment, we finish our noodles and stare at each other in disbelief. In the week we have been here, we have returned to the restaurant nearly every day. We expand our knowledge of the menu with each visit, and keep an English-language cheat sheet of the menu.